WILIMINGTON, NC: Planning a family vacation can be tough. Making sure the kids get their beach day and ensuring parents have a chance to try the local IPA while also selecting vacation activities for the whole family can be a stressful and daunting task. With activities that both adults and kids can do in Wilmington and its Island Beaches, planning a trip here is a breeze. From activities tailored to the younger set and others for adults, all in the same place, to adventures the entire family can enjoy together, this coastal destination ensures the entire family will fulfill their vacation wish lists. Something for the kids and something for the adults. 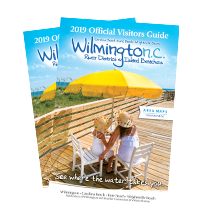 Wilmington and its island beaches have numerous museums, activities and other events where children and adults can simultaneously partake in separate activities. Take your children to the North Carolina Aquarium at Fort Fisher at Kure Beach where kids’ programs combine fun and learning with hands on, feet wet experiences for children ages 5 to 13. While your kids are off exploring the local marine wildlife, adults can stay nearby and settle into a canoe for a trip around Zeke’s Island or stay onshore for surf fishing lessons to learn casting and local fish identification. To get in touch with your family’s creative side, head to the Cameron Art Museum where kids can learn art history then take a stab at crafting a piece of their own. At the same time, adults can tour one of CAM’s numerous exhibitions or participate in one of the museum’s featured events, like concerts from local artists or talks with art experts. Wrightsville Beach visitors can let their little ones play with fellow travelers at the Blockade Runner Beach Resort’s Sandcampers Kid&apos;s Club or the Holiday Inn Resort&apos;s Kids Club. Each of these programs offers its young guests crafts, games, meals, activities and more. Parents and adults, on the other hand, can take advantage of these resorts’ other outdoor offerings like sailing, kayaking or standup paddleboarding (SUP). Plan an exploration the whole family will enjoy. Start your journey through Airlie Gardens’ “An Educator in the Garden” program or join the monthly bird hike. With 67 acres containing formal gardens, wildlife, 10 acres of lakes, the majestic 473-year-old Airlie Oak and a seasonal butterfly house, each member of the family is bound to take home some new knowledge. You can also discover more about the local flora and fauna at Carolina Beach State Park and Fort Fisher State Recreation Area. Each is home to some of the coast’s most precious ecosystems and animals, like loggerhead sea turtles, piping plovers and other rare and protected species. Looking for something a bit more adventurous? Surf’s up! Parents and children alike can learn to surf with WB Surf Camp or Crystal South Surf Camp at Wrightsville Beach or Tony Silvagni Surf Camp at Carolina Beach. Each of these camps has lessons available for kids, adults and families interested in hanging ten in the Atlantic Ocean. For those that prefer to stay dry but still ride the waves, Wrightsville Beach Scenic Tours & Water Taxi offers a wide range of tours and excursions for visitors of all ages. If you hit the point of your vacation where you just need a break (and maybe a beer…or two), take the whole family to one of Wilmington’s family-friendly craft breweries that offers outdoor space and games for the kids. Parents and kids alike will enjoy throwing their frisbees during a game of disc golf at Good Hops Brewing in Carolina Beach, and Waterline Brewing Co. for the squirt guns, air hockey and basketball. The fun doesn’t have to stop once the sun goes down. Airlie Gardens holds a family-friendly concert series every first and third Friday of the month through mid-September in Wilmington, while Wrightsville Beach Park hosts the Sounds of Summer concert series each Thursday from mid-June to early August. Families and friends are also encouraged to attend the Boogie in the Park outdoor summer concerts at Kure Beach&apos;s Ocean Front Park, taking place the first and third Sunday through October, as well as Fireworks by the Sea and Boardwalk Blast at the Carolina Beach Gazebo every Thursday through August.